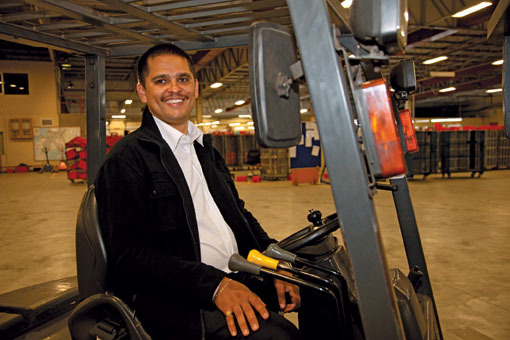 How a young man from humble beginnings made his way from forklift driver to advocate. Security is tight at Cape Mail with numerous barriers to cross before entry is permitted. After making it past the stringent checkpoints, I am escorted to an office tucked away at the end of the longest corridor I’ve ever seen. There Marlin Rhode greets me and I can’t help but comment on the lengths I’ve gone to in order to get to him. He laughingly admits that he and his colleagues dub the corridor ‘the long walk to freedom’ at the end of a hard day’s work. Befittingly, a framed picture of Nelson Mandela takes pride of place on his desk, alongside photographs of Marlin’s wife and two adorable children. But despite the in-house jokes about the passageway, this is a man who truly loves his work and he jumps at the chance to share the story of his success. ‘I grew up in Montana, a suburb close to Cape Town airport,’ he begins. ‘My schooling was fairly normal: from Windermere Primary, I went on to Kensington High School. Sure, there were kids there who were drinking alcohol and smoking dagga, but that never appealed to me. I was in with a good crowd of friends and the one thing that was always in the back of my mind was that I didn’t want to disappoint my parents. They had ­– and still do have – so much faith in me. My parents worked hard to provide us with everything we needed in life, ensuring there was always electricity in the meter, clothes on our backs and food on the table. ‘Teachers were stricter in those days. The meneer would klap you if you didn’t dress appropriately. You were scared of them back then, but it was a good fear, if I can say that. There was one woodwork teacher, Mr Hudsonberg, who had a wooden box on his desk and if you didn’t get the required results in woodwork, you would have to pick a number – that was how many lashes you’d get. It was actually better to get a higher number, as he would apply the cane more gently! Marlin stops and opens a desk drawer, pulling out a dog-eared piece of paper – his first ever pay slip – testifying to his then meager earnings: the princely sum of R1000 per month! Meanwhile, outside the world of work, wedding bells had sounded and in 2004 his wife, Carlenette, gave birth to their first-born, a daughter they named Phoenix. ‘Her arrival changed everything,’ he professes. ‘It was a real light bulb moment for me; the proverbial penny dropped and I realised that if I carried on as I was going, we would never be in a position to provide Phoenix with the kind of upbringing we wanted for her. If she was to have a great education, I was going to need to bring home a salary to sustain that. So I decided then and there to equip myself with at least a degree so that I could secure myself a job with more earning potential. Problem was that I had absolutely no idea what I wanted to study! But Fredricks’ words stayed with him and sure enough, he applied to study law at UWC. ‘When I received my provisional acceptance, I was shocked out of my wits!’ Marlin grins. And so the hard work began… from Monday to Thursday, between 2005 and 2010, Marlin ended his working day by hauling out the books and putting his head down to study. Looking back, he admits that he couldn’t have done it without the unwavering support of his wife. 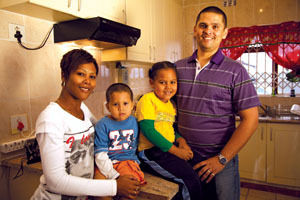 ‘My family were truly the driving force, I did it all for them,’ he states proudly. ‘My wife also works at the Post Office as a supervisor, so that made it easier for me to study long hours. She never distracted me or complained. We both wanted the world for our children (by now our son, Zachary, had been born). It’s easy to wish for your child to become a rocket scientist, but you have to provide the means for them to get there. I ask Marlin a question that’s been on my lips. A law degree doesn’t come cheap… How did he afford to fund his studies? Initially it was hard. For the first year I had to fund my own studies, at around R10 000. I’d applied for a bursary from the Post Office in 2004, but didn’t get it. At the time I felt my employer saw me as a forklift driver with delusions of grandeur! But I had a point to prove, and refused to let this hurdle stand in my way. I would show them. I wasn’t a forklift driver applying for a bursary to do a law degree; I was Marlin Rhode applying, and I knew I had the staying power to see it through. I studied like crazy and made the Dean’s Merit List. At the time I didn’t even realise what an achievement this was – I was a top performer in my group! But the decision-makers at the Post Office clearly noticed, and they agreed to fund my studies from that point forward. Around the time the Post Office provided Marlin’s bursary, the position of Employee Relations Practitioner was advertised and although he didn’t have all the required qualifications just yet, the powers that be now recognised his potential and awarded him the job. 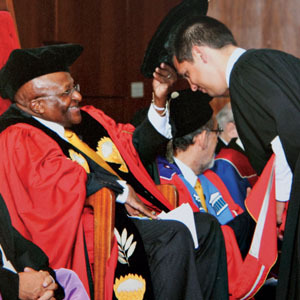 Six years and many hours spent sitting at a desk later, at the age of 31, this hard-working scholar wrote his final exams, and his dreams came true when he was capped by Desmond Tutu at an official ceremony at UWC. And colleagues at the Post Office further honoured the advocate’s achievements last year by presenting him with a Silver Star Award for Self Development at a glitzy gala in Johannesburg. It seems there is no stopping Marlin now… last year he applied to do his Masters and he is currently busy on his proposal. His thesis: A critical analysis of privacy in the work place. If all goes well, he should graduate in 2013. Seems that the long days of all work and no play are not over just yet. But he’s not even slightly phased. ★ Money talks (lets call a spade a spade). ★ We tend to set ourselves standards and believe that this is our pinnacle, but actually the sky is the limit. ★ It’s great to have dreams, but you need to be able to sustain them. ★ People will tell you that you are not good enough; that it is not possible. Be stubborn. If your mind tells you that you can do it, you probably can. ★ There is always a reason for everything, although it may be far from clear at the time. ★ Lawyers need to be equipped with the gift of the gab. I am not a fighter, but I earn my bread and butter with my mouth. ★ If you can’t negotiate, then this is the wrong profession for you. ★ As a parent you need to start saving early for your children’s education. Even just putting away R50 per month can make a difference. ★ There are times when you do get it wrong, but that’s just part of life. ★ Stress relief is important and having hobbies helps you relax. For me it’s cooking, I still have aspirations to be a chef (ask my wife! ).